100% Habotai Silk, Machine Washable! Sleep on nature's finest fiber, and soak in the benefits! These silk sheets not only offer exceptional comfort, they're also healthy for your skin and hair. Silk is a natural protein made up of amino acids, and studies have shown that sleeping with silk helps reduce wrinkles and damage to hair. The highest quality Habotai washable silk is used and features charmeuse silk piping on the hem. Silk adjusts to your body temperature, keeping you warm in winter and cool in summer by transporting moisture away from the body and into the air. 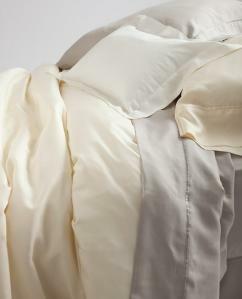 Silk is naturally very strong and resilient, giving outstanding longevity to these sheets.